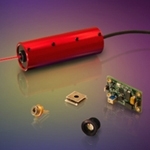 Thermal Management: The TECRL Series Laser System is designed to dissipate heat through its body. Please ensure that the mounting brackets are not made of insulating material. For proper heat dissipation and cooling, do not restrict air circulation around the device. An additional heat sink with integrated fan can be used to maximize the performance and extend the life of the laser system. TTL option is available upon request, it can operate from CW up to 155MHz, and the part No. will add .TTL, e.g. TECRL-7G-635-TTL. PV option is available upon request and the part No. will add .PV, e.g. TECRL-7G-635-PV. ** Module components sold solely for use in OEM equipment, OEM is responsible for compliance with all applicable safety regulations.